CALLS HAVE BEEN made for the returning Irish team to be given a civic reception in Dublin. This follows their heroic performance at Euro 2016 where the team reached the last 16 before being narrowly beaten 2-1 by hosts France. Fine Gael TD for Dublin North-West Noel Rock reckons the returning players should receive a heroes’ welcome on their return. “This has been a great tournament for our boys and I was delighted to attend a few of the games and cheer them on,” he said. They have come out of a difficult group and surprised everyone with their heart and desire. He has called on Dublin City Council to hold a civic reception for the players. This is just one of a host of tributes paid to efforts of the national side in France. When we lost in Glasgow a Scottish fan told me it was the worst Irish side in 30 years. So proud of these players. “The Irish team and its fantastic supporters have done the nation proud, and represented us abroad in the best possible way,” read a tribute from Minister for Foreign Affairs Charlie Flanagan. In tandem with the achievements of Northern Ireland, this tournament has given Irish supporters North and South memories to treasure for years to come. Also praising the players was Minister for Transport Shane Ross. “I wish to wholeheartedly congratulate the Irish team for their performance today and for their contribution in the finals of the Euro 2016 championships,” he said. Their performances on the field, under the guidance of Martin O’Neill and roy Keane, were passionate and impressive. Email “TD calls for returning Irish team to be given a civic reception ”. 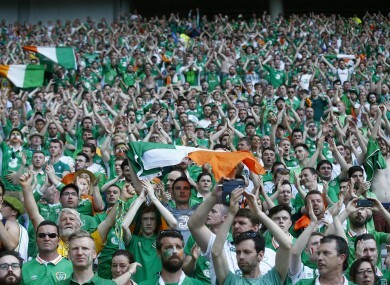 Feedback on “TD calls for returning Irish team to be given a civic reception ”.